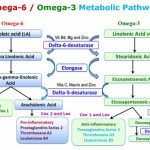 Similar Functions of Uric Acid and Ascorbate in Man ? The protective effects of antioxidants on endothelial function, LDL handling, inflammation, and thrombosis (top panel). 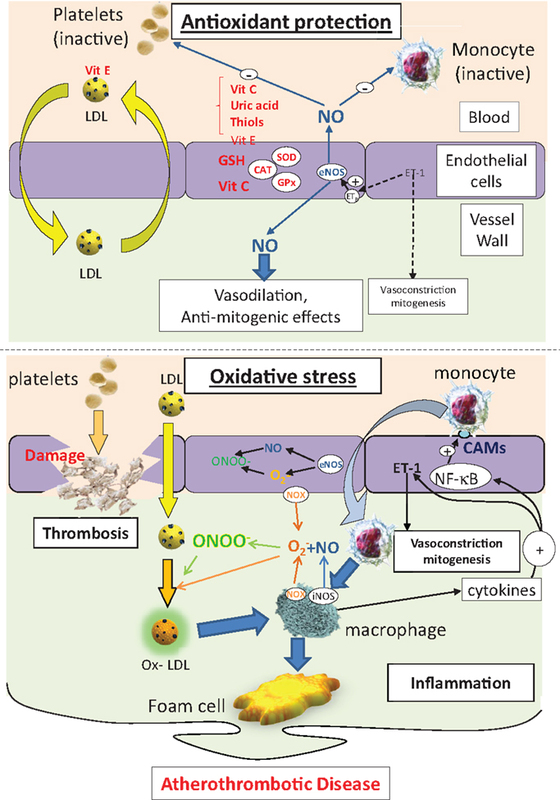 Under conditions of oxidative stress, endothelial cell damage, loss of the protective effects of NO, and enhanced LDL peroxidation combines to drive an inflammatory state, leading to lipid accumulation in the arterial wall. CAMs, cell adhesion molecules; NOX, NAD(P)H oxidase; eNOS, endothelial NO synthase; iNOS, indicible NO synthase; NF-κB, nuclear factor kB; SOD, superoxide dismutase; ET-1, endothelin-1; CAT, catalase; GSH, glutathione; GPx, GSH peroxidase; LDL, low-density lipoprotein; ox-LDL, oxidized low density lipoprotein; ONOO−, peroxynitrite; O⋅ −2O2⋅ −, superoxide; NO, nitric oxide. Similar Functions of Uric Acid and Ascorbate in ManPointing out the structural similarity between uric acid and the stimulant purines caffeine andtheophylline, Orowan (1) first proposed that the emergence of intelligence in the primate line mightarise from a single evolutionary event, the loss of the enzyme uricase, with the result that uric acidbecame the end product of purine metabolism. The only non-primate mammalian strain whose finalpurine metabolite is uric acid is the Dalmatian dog. Haldane (2), taking issue with this suggestion, proposed two hypotheses: that individuals with highserum uric acid levels should show increased intellectual abilities , and that such individuals should beunusually resistant to certain types of fatigue. Neither one of these has received much experimentalsupport, although serum uric acid levels have been correlated with social class, achievement, andachievement -oriented behavior. ( for a review of such work, see Muller et al (3)). The reasoning behind this suggestion is this: a number of the physiological functions of ascorbate aregenerally considered to be related to the unique electron-donor properties of this compound. Uric acid (along with the rest of the purines ) is also a strong electron-donor (5). In fact, on the somewhat tenuousbasis of molecular orbital indices, uric acid may be a better electron-donor than is ascorbate.(6). 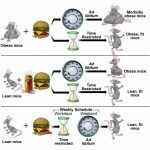 Ittherefore seems possible that ( in primates at least ) uric acid has taken over some of the functions ofascorbate. This suggestion is not to deny any other physiological or psychological function for uricacid, but is advanced to suggest an evolutionary mechanism for the loss of the ability to synthesizeascorbate de novo ( the latter lesion might not be very important in a fruit-eating animal except in timesof famine or in the event of a change in diet. ). Any further selective advantage of higher systemiclevels of uric acid would tend to establish the double lesion in the population. Texas Research Institute of Mental SciencesReceived April 27, 1970 , copyright Macmillan and co.
4) Mahler, H.r., and Cordes, E.H., Biological Chemistry, 475 ( Harper and Row, New York, 1966. 5) Pullman, B, and Pullmans, A., Quantum Biochemistry, 217 ( Academic Press, New York, 1963 ).